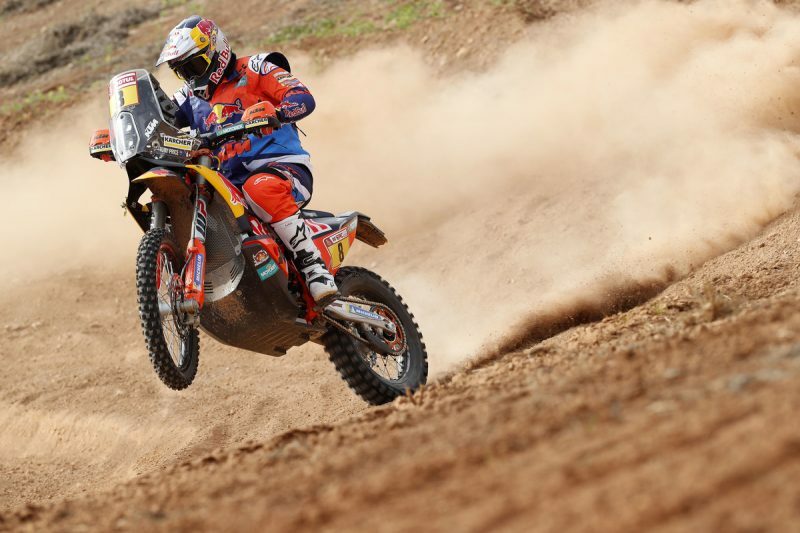 Following the move of the rally from Africa to South America in 2009, the routes and type of terrains used varied dramatically to the long, flat-out stages of the ‘original’ North African Dakar. In 2011 it was made compulsory for motorcycle engines to not exceed 450cc. This was advertised as ‘levelling the playing field’ for manufacturers in the hope of attracting different brands and with it possibly different winners. At this point KTM had already won the previous nine rallies. The other factor was safety, by reducing the capacity of the machines, overall speeds would be reduced with the bikes easier to handle during the arduous two-week event. 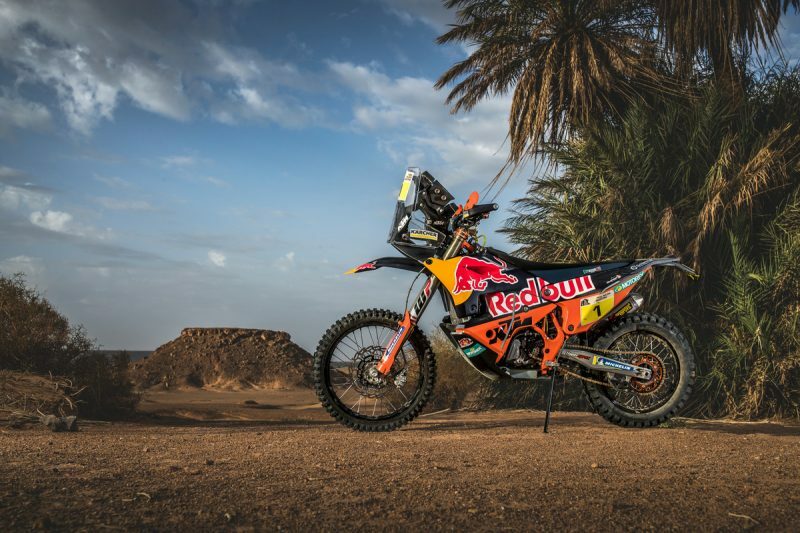 Going into the 2011 Dakar, KTM had very little time to develop a specialized 450cc machine. Their solution was to fit a carbureted 450cc motocross engine into the chassis of their Dakar-winning 690 RALLY. 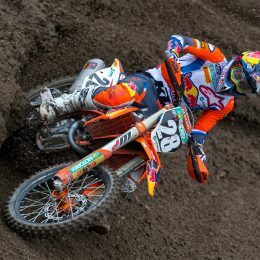 Although somewhat crude, the bike was a success and took Marc Coma to his third win at the event. 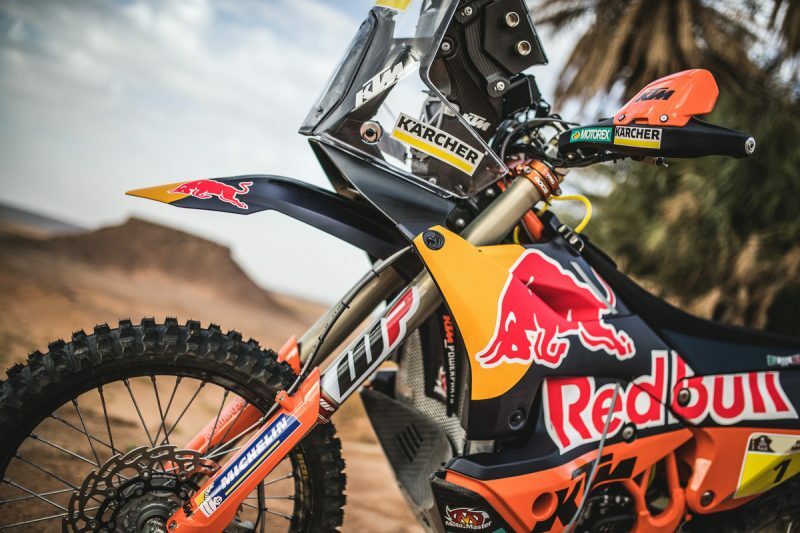 It wasn’t until 2014 that KTM released their first purpose-built 450 RALLY. The bike was designed around a new fuel-injected 450cc engine, the result of which was a far more agile machine. 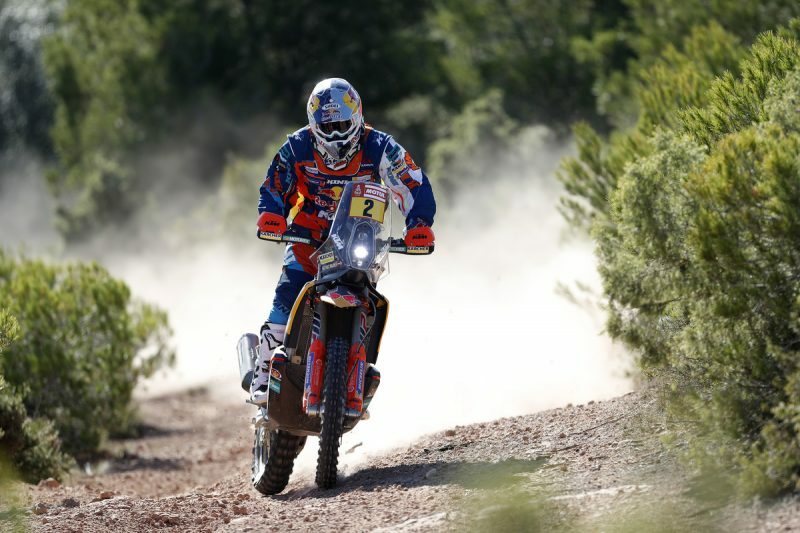 The 450 took Marc Coma to another victory and year-on-year has continued to dominate the Rally Dakar, right up to Sam Sunderland’s win in 2017. 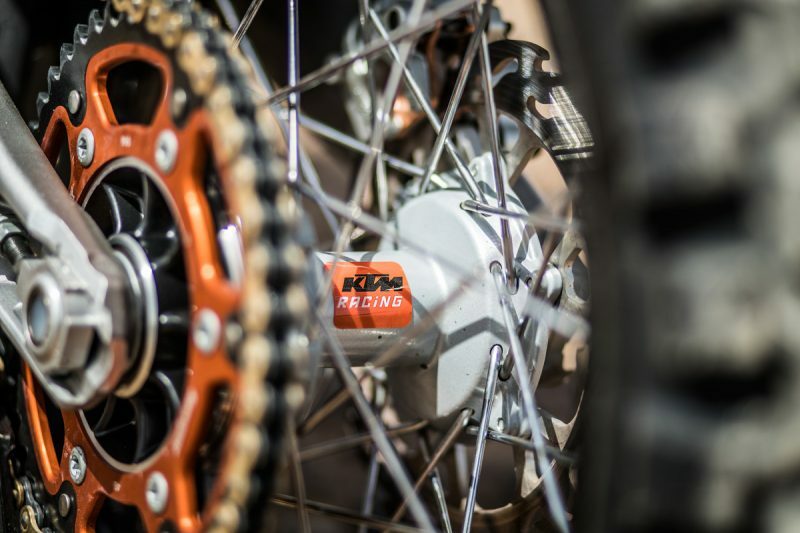 Despite their ongoing success, and not wanting to rest on their laurels, KTM already had plans for a newer, slimmer and faster machine. 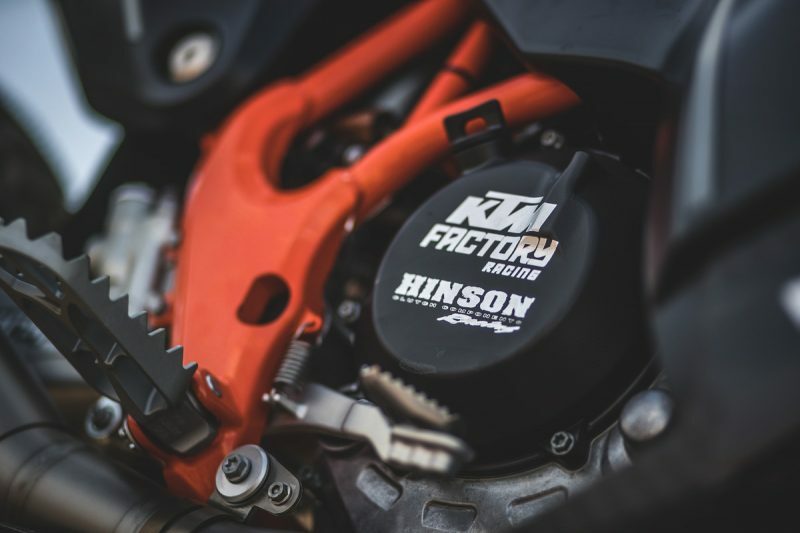 In development for over two years, the latest incarnation of the KTM 450 RALLY is the most capable yet. At first glance you can see the bike is slimmer and more maneuverable. Underneath the updated bodywork and fuel tanks are a whole host of other changes that have come together to create a winning machine. A new frame and swingarm instantly create a narrower bike, a slimmer feeling between the legs for the riders. The bike handles the more technical sections with ease due to the improved design and lighter weight – over 10 kg less than the previous model. The center of gravity on the bike is lower and has been pitched forward, aiding both stability and handling at speed. The swingarm now sits on its pivot inside the rear of the main chassis, this creates a stiffer rear end and makes the bike less twitchy when ridden hard over the roughest terrain. The rear subframe is fully self-supported, manufactured from carbon, and incorporates one of the fuel tanks. In total, the bike carries approximately 31 liters when fully fueled. Up front, to balance the other changes to the chassis, huge 52 mm WP forks are fitted, another big improvement over the outgoing 48 mm versions. The bike keeps it standard size wheels – 21-inch up front and 18-inch on the rear, both shod with Michelin tires and mousses. Moto-Master brakes are fitted to slow down the bikes, mounted on the rear is a 240 mm disc while the front carries a massive 300 mm rotor. These provide enough stopping power to bring the bike to a standstill from speeds of over 180 km/h. With the bike sporting an aggressive-looking black color scheme, Matthias Walkner took the new 450 to the win at the final round of the 2017 FIM Cross-Country Rallies World Championship in Morocco. It was Matthias’ first victory of the season and the Austrian attributed the success to an improved feeling on the new bike. To compliment the changes to the chassis, a new 450cc single-cylinder engine has been fitted. Not only providing better peak performance but also improved response. This is achieved by an all-new throttle body and engine management system. The bike is not only faster now but easier to ride at slower speeds when the going gets really tricky and the rider needs that added control. These combined advantages will really come into their own during an event like the Dakar. With competitors covering close to 9,000 km over 14 stages the race is tough on the rider as well as the machine. The new bike, being easier to ride fast over long distances and less of a handful in the slower, technical sections, will help riders stay fresh and focused. Laia Sanz will be contesting her eighth Dakar in 2018. The Spanish multiple world enduro and trials champion feels the new 450 may suit her even more than the rest of the team. 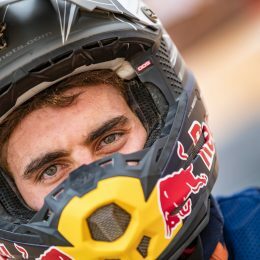 2016 Dakar winner, Toby Price has had a tough year. 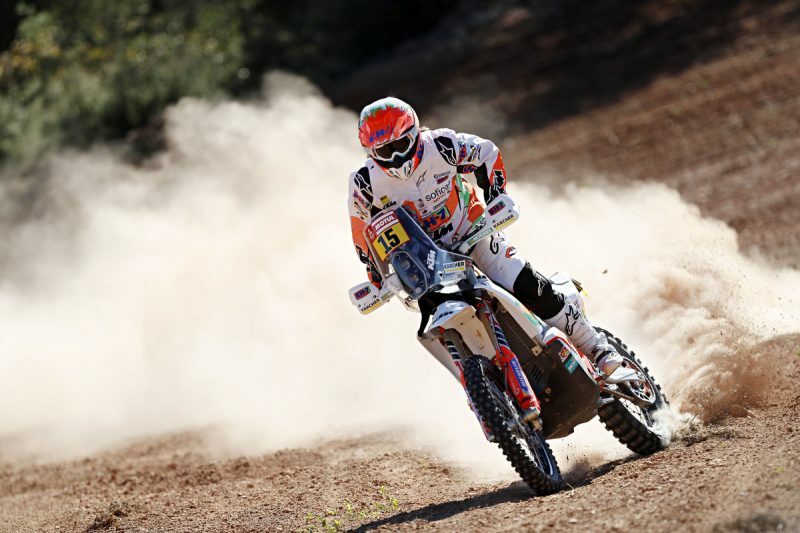 The Australian injured his leg during stage four of the 2017 Dakar – pushing hard to make up lost time, Toby came off his bike in a riverbed and fractured the thighbone on his left leg. What followed was a year of recuperation and eventually, further surgery to clean up his left knee and replace the rod in his femur. Toby has had very little time on any bike during 2017 and has only managed a couple of weeks riding on the new KTM 450 RALLY in its current form. Despite the lack of testing, the former Dakar winner is confident the new 450 can deliver another top result. The Rally Dakar starts on January 6, 2018. Close to 200 bikes will set off into the Peruvian desert on the beginning of their 9,000 km journey that will hopefully see them to the finish at the Argentinian city of Cordoba. 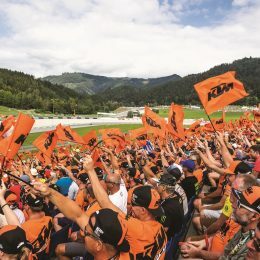 The KTM team of Sunderland, Walkner, Price, Meo, Sanz and Benavides will all be aiming to take the new KTM 450 RALLY to its maiden win, the 17th in a row for the Austrian manufacturer. Sweet but why isn’t Laia on the video?? ?